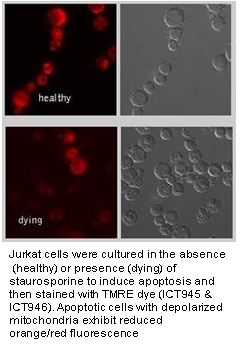 An early indication of apoptosis involves a collapse in the electrochemical gradient across the mitochondrial membrane. This is mediated by the opening of permeability transition (PT) pores and is known as the mitochondrial PT event. It is measured by the change in the mitochondrial membrane potential. 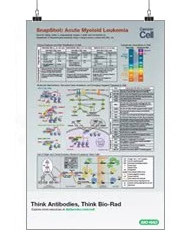 These dyes are lipophilic and have a delocalized positive charge, which enables them to enter cells and the negatively-charged healthy mitochondria. 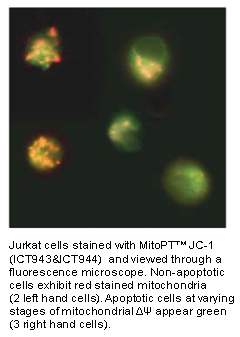 In non-apoptotic mitochondria, the dyes aggregate and will brightly fluoresce.